I travel a lot. For work mostly. But I love it because I get a lot of work done on the road. Whether it’s reading books, or writing or catching up on email, I tend to have bursts of productivity while I am traveling and then I get to enjoy myself on the trip. This is the bag I take as my under-the-seat carry on (never check bags! It’s a rookie mistake). It has everything I need to stay busy no matter how long the flight (most recently the 20 hours back from Sydney to Austin). Most recently I was on the road for my third book, The Obstacle Is The Way, which came out with Penguin in May. I also run my marketing company, Brass Check, and am the Director of Marketing at American Apparel. As if I wasn’t busy enough I’m also an editor at large at the New York Observer/Betabeat.com and I write for my own site and Thought Catalog. Writing Materials: To research for my books, I always bring 4×6 ruled index cards with me wherever I go. It’s where I jot down notes or sayings that I might want to use down the line. I also carry this Sony digital voice recorder ($55) for interviews. Travel Documents: For international travel, the right documents matter. I have my passport and of course, my Global Entry card (which is worth every penny). It lets me skip lines with pre-check domestically and breeze through customs when I’m entering the country. Customs in other countries are usually no sweat, but anyone entering the US through JFK knows how long the line can be. This is where Global Entry saves a lot of time. I also carry business cards for my gig at the New York Observer and my marketing company Brass Check. Books: Only physical books for me. 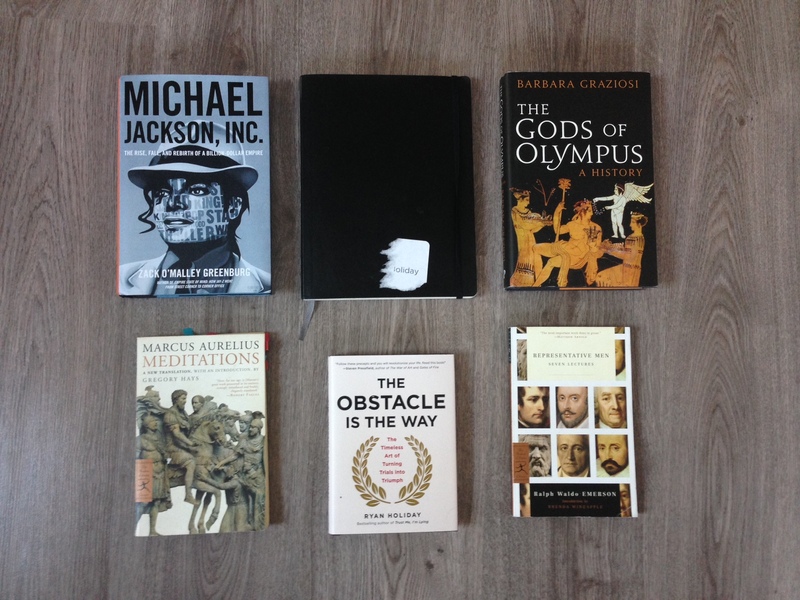 On this trip, I read Emerson’s Representative Men, The Gods of Olympus (which my UK publisher gave me in London the week before) and I just got an early copy of Zack Greenberg’s bio of Michael Jackson’s music empire. I always try to keep a copy of Meditations by Marcus Aurelius (this copy is 8 years old and filled with notes). I also have a copy of my new book, The Obstacle Is The Way, in case I need to give one to someone. I usually keep a few other books in my suitcase as well. In the middle is my Moleskine in case I need to take notes in a meeting. 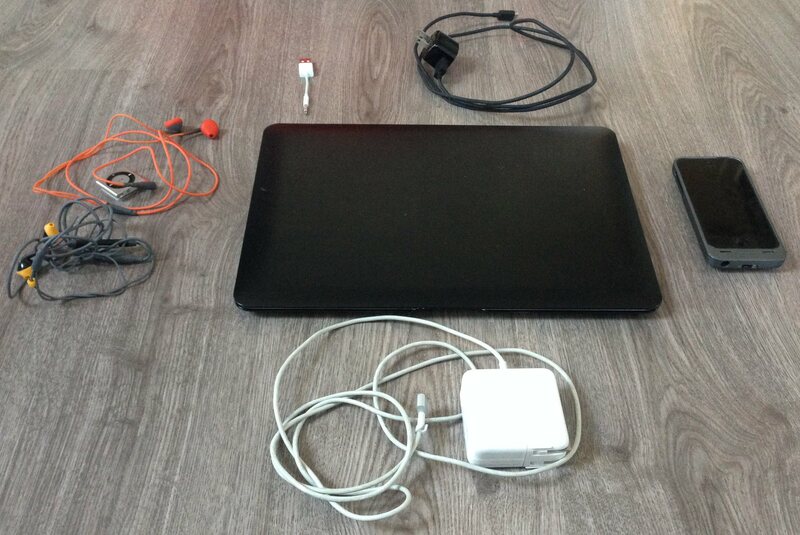 Electronics: I carry a MacBook Air ($950) with a black plastic case. My phone is an iPhone 5 with a Mophie battery case ($80). With my phone, I use the Phillips Sweat-proof headphones ($20) with a mic and with my iPod Shuffle ($69) I use the same headphone sans mic. This way I can go for a run with either. The respective chargers for all the devices are in the bag as well. Eyewear: Some polarized Ray Ban glasses ($106) (which I found randomly a few months back believe it or not). 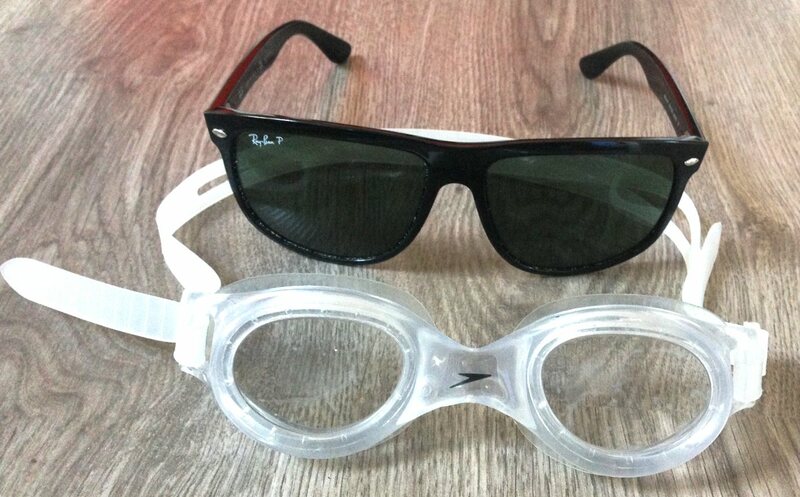 And Speedo goggles ($16). I try to swim in every place I go. The rock pools in Australia are maybe the coolest pools in the world…though Barton Springs near my house in Austin is amazing too. Medicine: If you travel a lot, especially for speaking, you get sick. 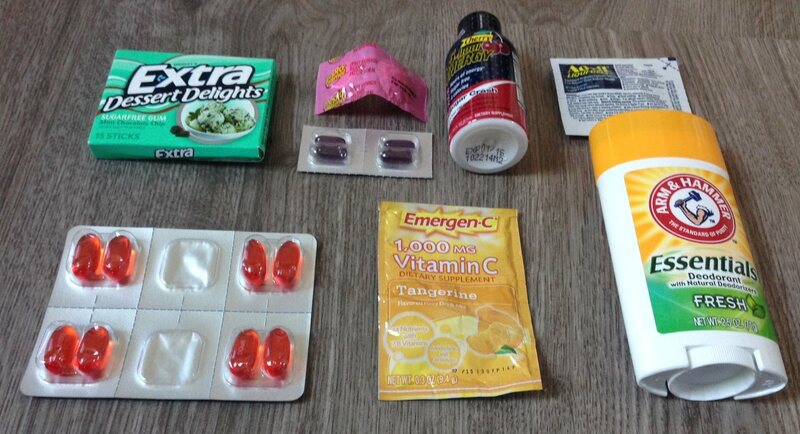 I carry Dayquil, Pepto pills, Advil, and Emergen-C. I also carry Zzzquil in case I have trouble sleeping. 5 Hour Energy is my caffeine substitute (I don’t do coffee or soda anymore). Who doesn’t love dessert gum? It takes like ice cream! Also Arm & Hammer deodorant — has fewer chemicals than most but actually works unlike Toms. 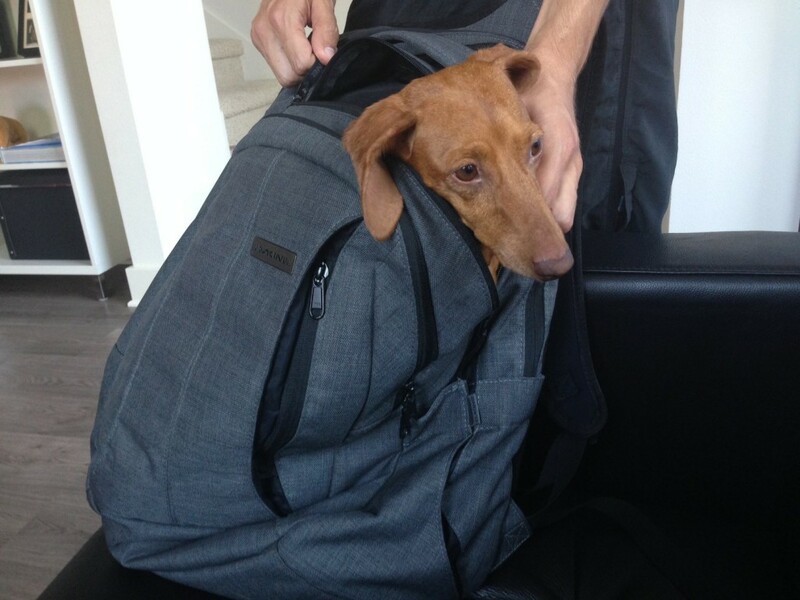 Dog: I wish I could bring the dachshund, Ms. Hanno. Unfortunately most places I cannot. But I wish. She’s good in the backpack though.